Back in 2014, I attended the Parenteral Drug Association (PDA) conference and we talked a lot about the teachable moment. 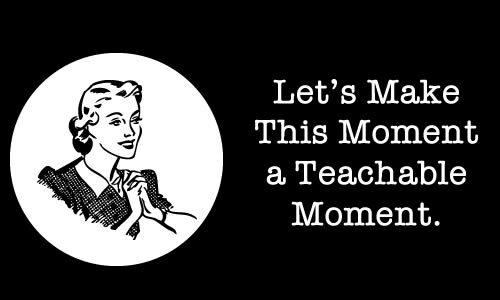 If this term is new for some of you, the “teachable moment” refers to a time when an individual is most receptive to learning something. It includes the idea that the thing learned at that moment, when the individual needs to know or use it, is likely to be deeply impressed on the person. It also includes the concepts that these moments are somewhat unpredictable and can be fleeting; it isn’t always possible to create teachable moments; and they may arise in very mundane situations, or in circumstances that are unusual and unlikely to occur again. Personally, I’ve always loved the phrase “teachable moment.” It has been foundational in helping people understand how the flow of knowledge supports a teachable moment. Can you describe a teachable moment in your organization? An example in the pharmaceutical industry can be found in the product lifecycle management process. As a product goes through the lifecycle of development, it may spend years in research, design, and commercialization. Learnings happen during trials that are run and when key opinion leaders and experts engage in dialog to support development. Many times there are gaps in what learnings, aka knowledge, are transferred to produce the product. This may have a potential impact on the cycle time for production and/or the overall quality of the product. Ultimately, the many touches and cycle time of this process produces countless teachable moments, not to mention that it has given KM a reason to exist for 2 decades. Now we are in the 21st century and Bob Dylan is talking to IBM’s Watson; Amazon’s “Alexa” is interacting with families; and I’m part of an APQC Advanced Working Group trying to understand how KM can better leverage the capabilities brought to us by cognitive computing. Won’t the ability to have information and knowledge brought to our fingertips make the teachable moment obsolete? Will KM leaders even need to manage processes and engage people as part of the KM work? Is this going to help or hinder mature KM programs? Will it make it easier to start up a KM program, not paying attention to all of the capabilities that have been important for years? Remember, video killed the radio star. I’d love to hear from you…I feel a teachable moment coming on. Whereas cognitive computing and predictive analysis surely will play a major role in knowledge management, the real problem lies with the fact that humans are not computers and vice versa. Humans have innate abilities and capabilities that far outperform computers in aspects such as intuition, belief, affinity for learning, moral mapping and the ability to innovate. The teachable moment being a case in point and specifically pertaining to the teaching of kids; although such a moment may be regarded as unpredictable, human innovation makes it possible due to the Teacher's experience and capability of sensing a 'teachable moment'. Therefore I underwrite and support Chris Smith's view that people need to interact with people - the shared connection is of primary value. Now if Cognitive computing can help with that in terms of the sense-making and decision-making in knowledge sharing, then that's the way to go. In my view teachable moments may be made more predictable by using predictive analysis in analysing behavioral tendencies that lead to or are defined as 'teachable moments'.